In this post we will look at configuration example of a WLAN using CLI only. To make it comprehensive I will illustrate a Guest WLAN configuration with Auto Anchoring feature as well. Here is the basic topology. Here are the conditions for this Guest WLAN. – Guest user traffic should get lowest QoS priority. – WMM to be disabled. – Guest users only able to get 802.11a & 802.11g data rates. 2. Configure the interface for vlan9 on WLC1 & map it onto “guest-9” WLAN. 4. Configure Mobility Anchor for “guest-9” WLAN.5. Here is the CLI configuration of each task. For the QoS profile configuration you have to disable 802.11 radios (both 2.4GHz & 5GHz). It is advisable to configure all 4 QoS profiles even though this only require Bronze profile to configure. Now you can define the “guest-9” WLAN & map vlan9 interface onto it. Even though we are not using GUI, you need to remember the General, Security, QoS, Advanced parameters to be modified as per the requirement. CLI commands flow is in that order. Note that since we do not want to override interface DHCP server, we will use 0.0.0.0 as DHCP server address & only make DHCP address required when configuring that feature. Now you can copy this configuration to WLC2 & WLC without the line “config wlan interface 9 vlan9”. By default newly created WLAN will map to management interface. Here is the configs in WLC3 for example. Do the same on WLC2 as well. DHCP server override is applicable only to the default AP group. Final step of configuration is creating Auto Anchor Mobility tunnels. First of all you have to configure the mobility group name in each controller & then add members to mobility list. In this example I have used DMZ, HQ, & MO for the mobility groupname of WLC1, WLC2 & WLC3. Also multicast group address 239.11.11.11, 239.22.22.22 & 239.33.33.33 for local-group members mobility communication in WLC1, WLC2 & WLC3. Also used multicast group address 239.12.12.12 between WLC1-WLC2 mobility communication & 239.13.13.13 for WLC1-WLC3 mobility communication. Once you configure the mobility config as above you should see the mobility status up between each other. Here is the output of WLC1. 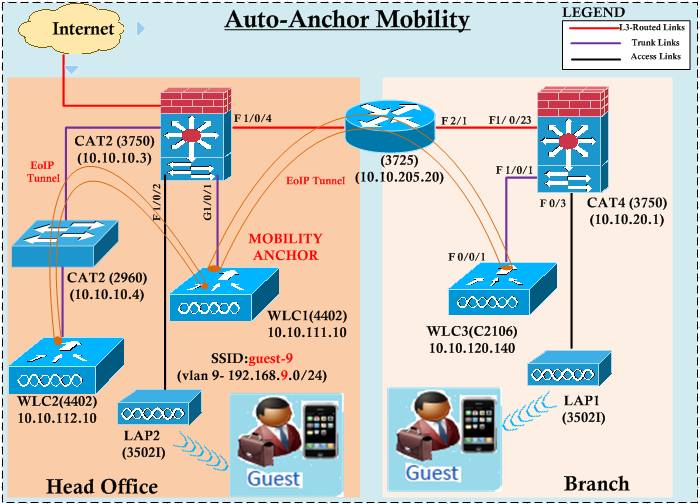 Now you can configure “Auto Anchor mobility” for guest-09 WLAN. You can do it as follows. You have to disable WLAN prior to configure mobility anchor feature. On the Anchor controller(WLC1) you have to anchor it to itself & on WLC2 & WLC3 it has to anchor to WLC1 IP. (WLC1) >config wlan mobility anchor ? add            Add/Change a Mobility anchor to a WLAN. delete         Delete a Mobility anchor from a WLAN. (WLC1) >config wlan mobility anchor add ? <WLAN Id>      WLAN identifier between 1 and 512. (WLC1) >config wlan mobility anchor add 9 ? Once you connect to this WLAN & open up a browser page, it should prompt you to enter your email address. Once login is successful you should able to see the client detail on your anchor controller(WLC1). Once you enable LAP2 ( disable guest-9 on WLC3) you should be able to check it in HQ end. If you do “Debug mobility handoff enable” at WLC1 you can verify client state changes & mobility communication between foreign & anchor controllers. Finally you can configure foreign mapping for this where you can allocate 192.168.9.x/24 if you are connecting from Branch & 192.168.8.x/24 when you are connecting via Head Quarters. So we will create vlan8 interface on WLC1 & trunk this to WLC1 on CAT2 g1/0/1 where WLC1 connected to. Now on WLC1 you can configure foreign mapping for guest-9 WLAN using the foreign controller MAC address as shown below. For WLC3 (00:1b:d5:cf:e6:00) Guest traffic would get 192.168.8.0/24 IP & for WLC2(00:0b:85:40:a1:c0) will get 192.168.9.0/24 IP range. Here is the verification when Guest user connecting via WLC2. Here is the same output when guest user is connecting via WLC3. You could see client get 192.168.8.x/24 IP this time. That’s all for wireless guest wlan configuration tasks via CLI. If you understand & remember the steps then you are pretty safe even if your WLC GUI is very slow during the exam. We will see a wired guest wlan configuration via CLI in a future post.